ICMYI, 2017 is over. If you’re anything like us (and we have a feeling you are), you’re still just on the hunt for your perfect brow product. Well, that particular priority will have to take a back seat, for now. Because with a new year, comes shiny, new beauty trends to try—and the perfect excuse to buy a new lipstick. So get ready to update your beauty bag and brush off your styling tools—here are our favourite beauty trends you’ll be rocking in 2018. From Gucci runways to Ariana Grande, hair accessories of a new kind are set to be #trending in 2018. From bobby-pins sportings oversized pearls to hold your part in place to a hair pendant to rock with your Coachella-style braids. Nope, jewellery is no longer just for your body. Check out Australian brand, Kela, who have a huge range –think a silicone clasp hair jewellery for every occasion imaginable. It’s like 1997 “butterfly clips” for grown-ups and we dig it. Glitterbugs pay attention—If it sparkles, shimmers or shines, then it’s set to be big in 2018. 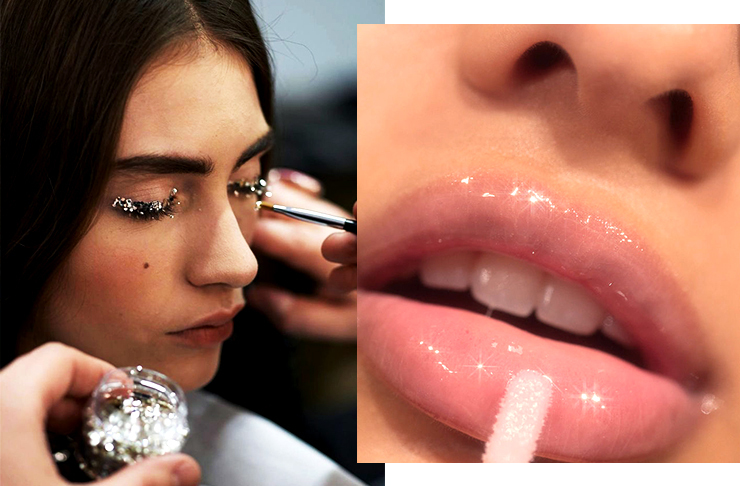 Think glittery eyelids, metallic manicures and shimmering lips. Not sure where to start? Try swiping our fave glitter eyeshadow—Stila’s Magnificent Metals Glitter & Glow Liquid Eyeshadow—over your lids this NYE. Hey matt(e), we really loved you this year but 2018 is our time to shine. Well, at least it’s our lip’s time to shine. Glossy 2000-inspired lip-glosses are back so put down the liquid matte lipsticks and slather on your favourite gloss We’re sorry in advance for the awkward hair-caught-on-lips moments that are headed your way. If we hear, see or smell one more “contouring” technique or how-to video, we might just stab ourselves in the eye with a mascara wand. Luckily, 2018 is not the year for extreme contouring and it’s about god damned time. Instead, try brightening your complexion with a sheer rosy blush, like this one from NARS that’ll suit every skin tone. First, there were K-Pop beauty products. Then came the infamous (and kind of crazy) 12-step Korean skincare routine. And now comes the Korean beauty trend you're about to see errrrywhere—we’re talking about Glass Skin. It’s essentially super hydrated, dewy, translucent, baby-like skin (#thedream) and it’s going to be BIG in 2018. How do you get magical glass skin, we can hear you asking? Drinking a shi*t tonne of water, get serious about your skincare routine (seriously, marry the damn this), face-mask every other day and get regular facials. Commitment is required for this one but the results are so worth it. Tattooed and micro-bladed brows had a big moment in 2017 but guys, in 2018 it’s all about the Henna Brow. Pioneered by ultimate brow-babe and Australia’s most celebrated brow stylist, Amy Jean, Henna Brows are a super natural alternative to harsh tattooed brows. Perfect arches on your agenda for 2018? Try this treatment for an all-natural, next level “brow tint” that lasts up to a month. 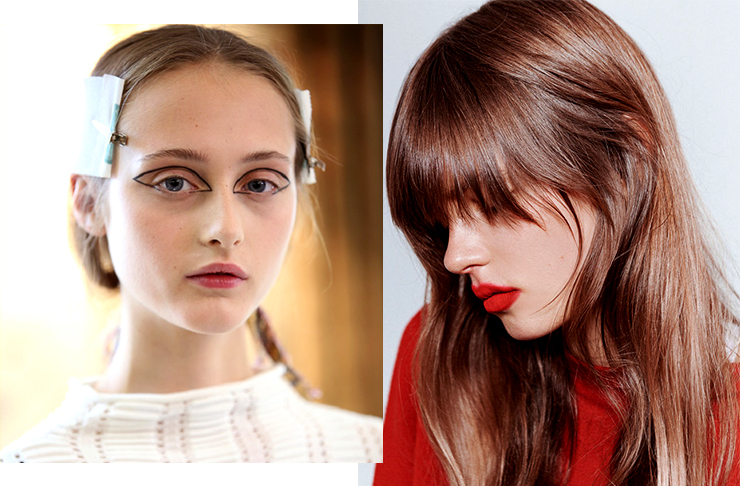 Statement liquid liner is set to be big in the new year. Channel modern Twiggy in 2018, and try your hand at lining your eyelid crease with a graphic, super-sharp black liner instead of your lash-line. If all else fails, the classic feline-flicked liner is fail-proof, Just don’t try this when you’re in the car. You just don’t need that kind of stress in your life, okay. Ah, the ever-timeless red lip. Let’s be real, this one will never go anywhere. But for 2018, the red lip 2.0 is all about a lived-in red stain, as opposed to a perfectly defined and lined lip. It's been called the ‘lollipop lip’ or ‘popsicle stain’ but we just say you should try a sheer red lip stain or blotting your super-bright red lippy on a tissue after applying. Did you notice we said sun-kissed? Not sun-smothered? Step away from the super dark, Geordie/Jersey Shore-style (faux) tan because 2018 is the year of the skincare and sun-care fusion. Next-gen self-tanning products launching in the new year are a hybrid of skin-loving ingredients and tanner to give you a super natural healthy glow. We’re loving home-grown tanning brand, Ms. Lova, founded by pro spray-tanner, Natasha Mikhaylova, whose mission is to change people’s perceptions of fake tans being orange-toned, sticky and skin-drying. Now, this one, we love. Feeling a bit dusty? We've got your hangover makeup survival kit sorted.